A crunchy attack, then creamy, with the sweet and soft smell of the rose. The delicate perfume of the orange blossom, in a sweet flavor macaron. Unctuous! A gourmand macaron. A smooth salted caramel. 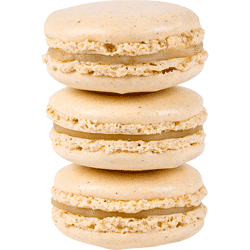 Its sweet flavour and distinguished perfume make of this macaron the world’s bestseller. A classic, with the sweet taste of the raspberry jam. Its texture is soft and its perfume is light and fruity. The Eastern delicacy of the pistachio, in a sweet macaron. Its texture is creamy. Two shells of almond macaron garnished with marshmallow scented with strawberry candy. A macaron garnished with a cream made with an infusion of 100% Arabica coffee. The natural coffee flavour, grilled and aromatic notes. The delicate and exotic perfume of the vanilla of Madagascar, for a macaron in a sweet flavour. Its texture is creamy. Two delicate macaron shells garnished with a blackcurrant jam perfumed with violet naturel essence. Franc fruit notes, light acidity and delicate floral notes. Two macaron shells and a creamy filling made with whole crushed lemon (zest, zist, flesh, juice). A natural and clear taste of lemon, sourness and a touch of bitterness. Two light blue macaron shells filled with a smooth cream infused with Marie-Antoinette tea. marriage of black tea from China and India, with hints of rose petals, citrus, and honey. A 70% cacao, sweetened by the crémeux of the ganache and the almond powder, which preserves its intense flavor. Two shells of almond macarons garnished with a creamy peanut butter filling. Two shells of macarons garnished with a poppy strawberry jam. Two shells of macarons garnished with a citrus yuzu filling. Two shells of macarons garnished with vanilla lime cream. Two delicate shells of macarons garnished with a violet pepper cream.